Many people ask me, “What does this mean?” As they point to a mysterious marking in their hand. Maybe you have wondered about a few markings in your own hands. In all aspects of the hand there is an upside and a down side possibility. I like to say a good hair day/bad hair day potential. When I have my hair done at the salon there is a likelihood for a great outcome that I’m really happy with or something that needs to be redone! Eeek. Throughout your life, haven’t you experienced exceptional hair days and miserable hair days? This is the dance to a just right hair day? Sort of like Goldilocks moving through the beds that were too hard and too soft to get to the bed that felt just right. See the simple hand map below along with a few descriptions of markings. Check your hands – and your friends too! Venus is the goddess of love and pleasure. 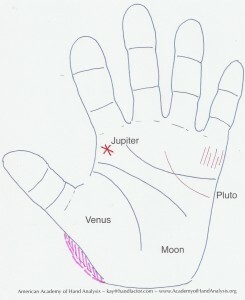 The Venus mount is the area where the thumb plugs into the ball of the palm. Pink ink is showing the expansion of the Venus zone. If this area is rounded and full – sort of voluptuous looking – it indicates an man or woman who is sensual and in touch with her appetites whether they consist of lush velvet curtains and romantic candles, fancy wine and cheese or hunky men with appealing bodies to touch. Tip for a voluptuous Venus: Enjoy your passions but keep those desires in check. Alternatively, if this Venus mount is flat, hard to the touch, and straight along the edge of the mount, the owner may be challenged to find joy in their life. She may be all work and no play. A person with a flat Venus zone might complain about being bogged down with work and responsibilities and unable to express where she feels joy in their life. Tip for a flat Venus: Keep a joy-journal. In the joy-journal, identify what brings you delight. When do you feel your best and how can you bring more of delight and enchantment into your life? Jupiter is known as the Sky God with exceptional vision and requirements for a large territory. If someone has a 6-pointed star, like an asterisk on the mount under the index finger, then I’d read her as an ambitious woman gifted with the ability to influence. She has the forte to galvanize change in the world. She may sense an invisible and constant ‘push’ on her back to keep her moving forward toward results. The bad hair day possibility with the star on the Jupiter mount is that she could take the back seat to another leader, manager or King and act as the lady behind the throne. She would eagerly align the kingdom to the other leader(s). However, while in position behind the throne, the followers will still most likely see her as the one to obey. Ideally, she is gaining experience and aiming to claim her authority, pointing the way with her own vision, reigning over her own Queendom. Tip for the gifted leader: Oversee from your own throne to feel most fulfilled. If you have both a full Venus mount and a Star on Jupiter then others may see you as a charming and generous leader, lavishing your followers with the deliciousness of life. 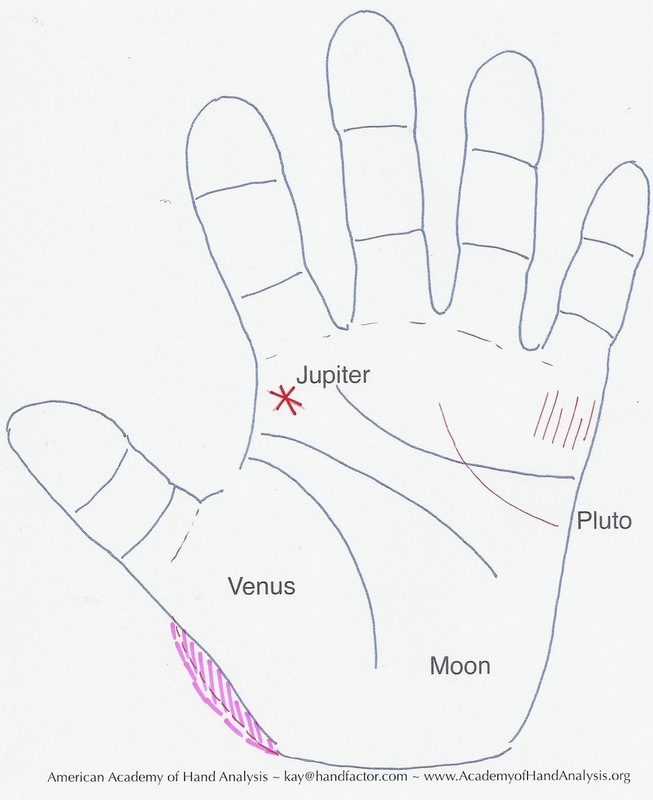 Watch for the next lessons on the Pluto Line and the vertical lines under the pinkie finger.